Are you a fan of Shalimar? The Champs Elysées is a natural home to what was a family owned business for 5 generations from 1828. 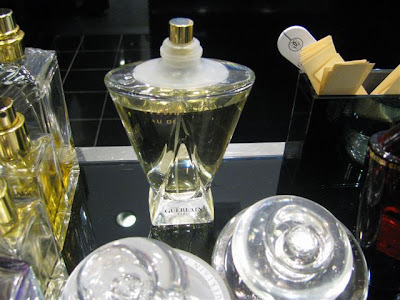 Only in 1994 did Guerlain become a subsidiary of the luxury group LVMH. The founder, Pierre-François-Pascal Guerlain, initially studied chemistry in London. And in many ways the uniform apothecary-style presentations stayed true to the foundation of the business as a perfumeur vinaigrier (perfume and vinegar maker). Elfie at Guerlain, original watercolor, 9" x 11"
After breaking the bank at Sonia, I headed over to Bloomies to take a look at their Guerlains. No one seemed to mind my shooting or testing a few out. I'm still deep in Chandler Burr's The Perfect Scent and there's quite a bit about this perfume house. This is a "touche" - those white paper strips salesgirls aggressively wave at you, as you try to mind your own business. It's a way to sample the perf, but is it the same effect as spritzing your wrist? Qui sait. Still there has to be some way you can test these things without smelling yourself up like a floral hothouse! "The natural creates a much greater allergy potential...and naturals (we're talking perfume ingredients here) pose a sourcing challange. What all-natural people don't realize is that synthetics are better ecologically. And if you're wondering what l'heure bleue is...? Thanks for introducing me to The Perfect Scent which I just finished. This book wakes you up to remember to use all your senses. Inspired, I visited a local store to try some of the perfumes he raves about in the book, including Comme des Garcon's Incense Avignon and The Different Company's Sel de Vetiver FYI www.boisdejasmine.com has great perfume reviews and www.perfumecourt.com will sell you sample sizes of just about anything available. Oh, I'm going to have to jot down all these wonderful sites online to check out. I'm still on the perfect quest. haven't found it yet...love your watercolor Carol! We spent a magical interlude in Guerlain. It is just gorgeous inside. Until then, I didn't know that vanilla was from an orchid! Shalimar was my mother's favorite. L'Heure Bleu is mine, along with Chanel #5 and Hermes, 24 FAUBOURG. Great watercolor as always, whimsical and sophisticated all at once. Thanks Laura for the perfume links. Yes, THE PERFECT SCENT has sent me venturing into perfume departments fearlessly and I hope to continue in Paris as well. I remember having a Guerlain perfume back in the 80's that my mom bought for me. I don't remember the exact name. 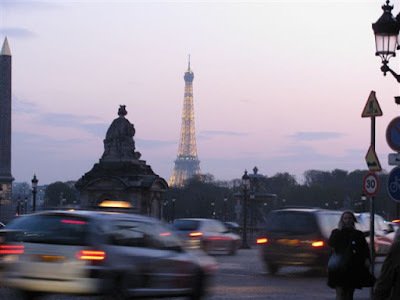 I was just a teenager and all I knew was that it smelled great and I loved that it was French. I had no idea that there were even sandalwood forests, but they must smell amazing. It's horrible that they're being destroyed. There definitely is truth to the idea that naturals have great allergy potential. I've tried using Origins skin care products specifically because they're natural, but I break out and just gave up using them. Love the matte gold tiles inside the Guerlain store in the elevator lobby -- they're simply divine! I can't wear perfume because of the alcool , my allergy breaks out from the parfume and than you smells only alcool. and the perfume without alcool vanish after 5 minutes. PS: More snow & icky weather on the way down here. I could scream. But I won't. How uncool. Thank you so much for this post. I am a huge Guerlain fan. I bought my first bottle of Mitsouko in my teens (30 years ago) and I still love it as a fragrance. I find I can wear Champs Elysees now I am older (it was too sweet when I was young). 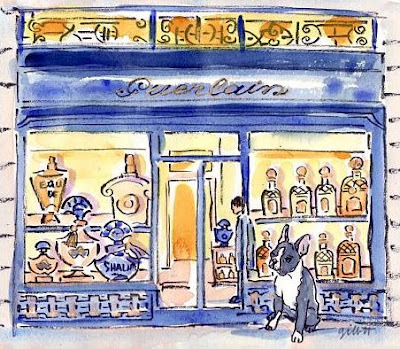 Lovely to read about perfumes - and that's a great watercolour! J'adore l'Heure Bleue! (But the time of evening.....) I will be an opinionated commenter. I just can't agree with synthetics. I don't think they last as well on the skin. But a wonderful post. Who wouldn't want to live in a room filled with those perfume bottles? Great photos, Carol (and Peter)- those "blue hour" shots and the interior close ups are excellent. Sincere thanks for quoting my blog ... and of course especially for the wonderful portrait of my daughter's little Boston Terrier! such a an exquisite scent. 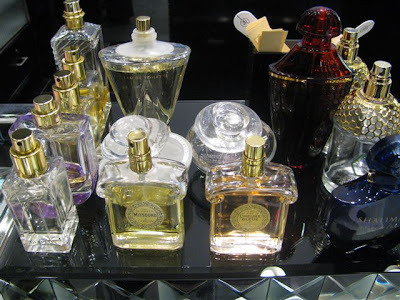 I love Guerlain's perfume bottles, also some of their fragrances, alas, my skin does not play along. I can wear Annick Goutal's without problems, though, thank goodness. That storefront with the sweet doggie turned out beautifully! thank-you for your wonderful website. I visit everyday, usually after work. I truly appreciated the photos and write up on the House of Guerlain. I have worn Shalimar as my "signature" fragrance for most of my life. How feminine I feel when wearing it and it drives men wild!!! I am so tired of Shalimar being labeled as an "old lady's" perfume. It stops men in their tracks!!!! Its subtle scent is so alluring-men always notice! My girlfriend just broke up with me...but maybe if I get her some Shalimar, she will reconsider..? I'm not a huge Chandler Burr fan, although he does know his stuff. Better perfume writing is out there -- try Perfumes: The Guide by Luca Turin and Tania Sanchez. If you want a more in-depth look at perfume and the sense of smell, Luca wrote a brilliant book called The Secret of Scent that will tell you more about fragrance than you knew you didn't know. 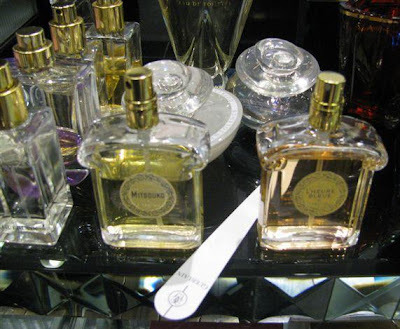 And don't miss the blog Grain de Musc -- Denyse's perfume writing is some of the best on the web. I've been a Shalimar gal since working at the perfume counter in high school (50's) and still love it today. How odd that one person's business did both perfume and vinegar! You would think the vinegar smell would trump the perfume and leave the smeller....senseless? Your drawings are amazing !!! I'm a big fan of Guerlain... wore "Chamade" for 5 years when I was younger and married a man which perfume was Habit Rouge and now is L'Homme de Guerlain. But I made a discovery in Paris lately, in the "jardins du Palais Royal"... The Little Salons of Serge Lutens... He is the most incredible and chic of all the french perfume designers. All the journalists in Paris are wearing his perfumes but refuse to say it, in order to be unique. Wanna see the boutique ? Anne, from Paris with love ! Thanks for pointing your fans to "The Perfect Scent" I'm enjoying it now!